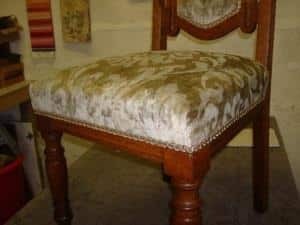 Beginners upholstery course at Huntlands Farm looks at both traditional and modern upholstery techniques and their uses. Bring a small project with you; it is suggested that you ring when you book to check the suitability of your chosen project. You will need sufficient fabric to cover your project, all other materials are stocked and will be charged for as you use them. Lucy holds a qualification with the Association of Master Upholsterers and Soft Furnishers having been trained in the use of modern and traditional materials and methods. Cost: is dependent on the number of days you attend and includes materials used. 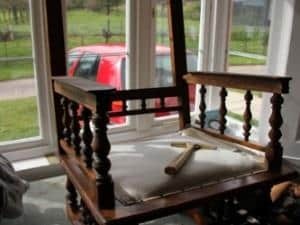 Please refer to the website www.huntlandsfarm.co.uk/upholstery for up-to-date prices and availability. All materials except the main fabric are kept in stock and a charge is made at the end of the course for the materials each student uses. You are however, welcome to bring all your own materials with you if you wish. Accommodation: can be provided at Huntlands Farm. If your partner wishes to join you, an extra £20.00 per night will be charged. Time: 09.30 – 17.30 with one hour for lunch; tea, coffee, juice with home-made biscuits and cake throughout the day! – Handling Tools Correctly – including hammers, tack- lifters, ripping chisels etc. To book: Contact Lucy by email lucy@huntlandsfarm.co.uk or mobile 0782 8286360. A deposit equal to one day’s tuition is required to guarantee your booking. If you cancel your booking within 14 days of your planned arrival date the deposit will not be refunded. A full refund minus £5.00 administration fee per person will be given if you provide 14 days notice of your cancellation. Please make your cheque payable to ‘Lucy Brodie’.